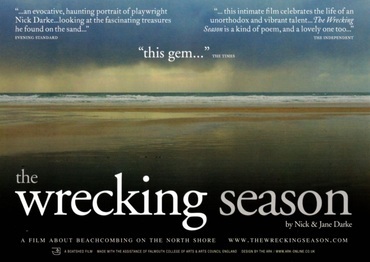 The ancient Cornish right of “wrecking”, harvesting the flotsam and jetsom thrown up by the ocean on the beach is the subject of Jane Darke’s award winning film “The Wrecking Season”. Her husband playwright Nick Darke came from generations of beachcombers or wreckers. In Jane’s film, he collects plastics and traces everything he finds along the coastline back to the source across the Atlantic trawling the internet. This evening is presented by Jane Darke in person with Q&A on plastics in our oceans past and future. The north coast of Cornwall is one of the best collection points in the world for long-haul drift. When a southwest gale blows for three days, artifacts and natural objects from across the world from Labrador to the Amazon Basin – wash up on Porthcothan Beach…….